Winthrop, our ram, is huge. He’s taller than I am when standing on four feet (Winthrop's four feet) – probably 48” at the shoulder, and weighs at least twice as much as I weigh – near 250 pounds (that’s his weight, not mine). He’s a good ram most of the time. His babies grow rapidly and he doesn’t attack the other rams, but his size has become a problem. It took Dave and I and Tom our shearer to wrestle Winthrop to the ground to shear him. Dave and I held Winthrop down while Tom worked. Lately, Winthrop has become unpredictable. He’ll walk quietly with his head in a bucket of grain into a pen in the barn, then minutes later when we’re trimming Percy’s hooves, Winthrop slams into the fence between us and hits Dave so hard that he’s thrown forward. We’ve sadly decided that it is time for Winthrop to go – either to a new home or into the freezer as sausage. As large as he is, Winthrop is not the largest living organism on our farm. That distinction goes to the grove of quaking aspen that grows in our woods pasture. Aspen make seeds, but they also reproduce by suckering, making new stems along their lateral roots. All the trees in a grove could be part of a single tree - exact clones of its genetic material, like the great Pando aspen clone in Utah. Pando covers almost 100 acres, weighs in total 14 million pounds and may be 80,000 years old. 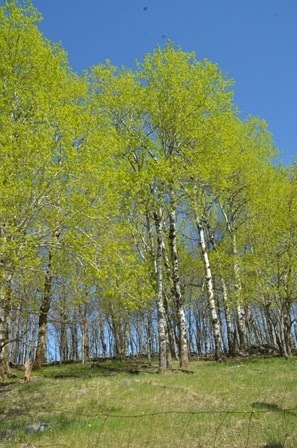 Our aspen grove only covers about an acre and is completely surrounded by pasture or hay field. Even at only an acre, the aspen grove is still the largest living organism on our farm, and unlike Winthrop, it gives us no worries. I love to walk through the grove in the early spring as the sun shines through the fresh green leaves. The rams shelter in the shade of that grove much of the summer and perhaps listen to the tremble of aspen leaves on their flattened stems, the rustle that gives quaking aspen their name. The stark black and white trunks fade into the snow in the winter, home to squirrel nests and fox dens. All through the year, the largest single living organism on our farm creates space for all the other living organisms to thrive.